One of the best Slow Twist Copper Loose Ring Snaffle Bits available here at Horse Tack Now. 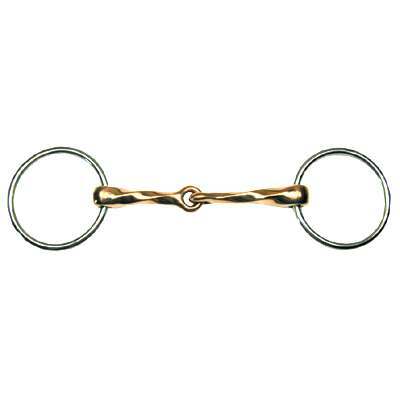 The Slow Twist Copper Loose Ring Snaffle Bit that we offer is a top quality item for your horse. The mouthpiece moves on rings, usually relaxes parts of the mouth and encourages chewing of the bit. The joint also creates a snapping action between rings and mouthpiece, the twist creates some additional pressure on the mouth. If you are in need of Loose Ring Snaffle Bits we have just what you need. We only offer the best horse bits for your horses at unbeatable prices.